With the support of our hi-tech production unit, we are eminent providers of wide assortment of Sports Flooring. Our offered range is crafted and designed under the supervision of our qualified professionals using optimum grade components and contemporary machinery. 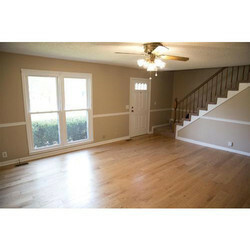 Our company has created a niche in the field of offering Sports Flooring. We hold expertise in providing sports flooring that is marketed in the domestic market at industry leading prices. We supply and install all kinds of sports flooring like rubber tiles, PVC sports flooring, in solid colours and wood finishes and specialised flooring for gymnasiums, aerobic rooms, kids play area, tennis courts, indoor and outdoor sports areas. Brands tht we represent are Ecoflex, Ebaco and Heritage. Flooring for tennis courts etc are certified by international regulatory bodies. 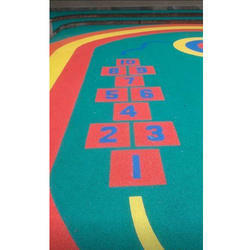 There are a broad range of Athletic Tracks that are coated with various materials. The tracks provide good gripping and are much preferred for the quality materials that are used. The materials conform to the international standards. We also manufacture the rubber flooring tiles. which are been made with rubber crumb & granules. We use the best quality SBR rubber crumb to manufacture these rubber tiles carrying best aesthetic designs. We can manufacture these tiles as per customers requirement, these rubber flooring tiles are manufactured under standard and customized sizes and can be used for out side applications.